touched by adoption or other loss of family continuity. While the organization tends to lean toward issues relating to adopted people and birth families, all members of the adoption “triad” or “constellation” are welcome. As an adoptive parent, I found myself in the minority but felt genuinely welcomed and included. Initially, my intention for this four-day event was to sell my book and network, but it became much more than just selling books. It brought me a much deeper understanding of my precious Casey, adopted from a Polish orphanage. In addition to adopted people and birth parents, we met activists, clinicians, therapists, nurses, social workers and members of organizations supportive of adopted people. It seemed that all members of the social spectrum were represented, including birth parents and adopted children reunited, some rejected. There were folks from the transracial and LGBT community. Adoptive parents were in attendance, but a good number of them had more than one connection to the adoption community – they were themselves adopted or even birth parents from the past. As ONLY adoptive parents, Erika and I were clearly in the minority. After several days of sharing personal stories with this diverse group, it struck me that, in all my years as an adoptive parent, I’d never spent much time at all speaking to an adopted adult or birth parent, and that may be a common experience of many adoptive parents like me. While Casey and other adopted teens I’d spoken to expressed no interest in their adoption history, these adults (in their 20’s, 30’s and older) – almost without exception – had reunited or were in search of their biological roots. Sometimes the reunion was joyous but many times the reunion was rocky. Still, I realized how crucial it was for these people to connect with their biological lineage even if the outcome was a disappointment. So a lingering question for me was how to deal with an adopted adolescent or teen who was clearly suffering from emotional and behavioral malfunction brought on by primal hurt, someone lashing out and in denial of their past, maybe out of spite against the birth parents (and adoptive parents)? I couldn’t get an easy answer from the attendees – even the professionals – but pieced together my own in an unscientific way. For that teen in denial, the adoptive parents can’t force a reunion on her, assuming they have the birth parents’ contact information or can find it. But they can let the child know that the contact is possible if and when they’re ready, an imperfect solution at best. Based on my own experience with Casey, it’s doubtful that no amount of cajoling, pleading and threatening will be helpful, especially considering the adoptees need for control. That’s where a qualified adoption therapist comes into play, because I don’t believe that adoptive parents are equipped to handle this delicate balancing act themselves. The therapist can work with the family to ask the right questions in the right way and help the family towards a satisfactory resolution to this primal relationship. After four days of sharing, listening, tearing up and weeping, I came away convinced that this organization can provide a lot of value to many other adoptive parents like me. It’s not that we’re closed off, we’re just ill informed. Even better, I think a conference like this should be a pre-requisite for prospective adoptive parents. Too often, we’re so desperate to get our child home that we believe (wrongly) that the heavy lifting is done. Smooth sailing from here. Just love ‘em enough. But that’s not true. The heavy lifting begins when you bring that baby home. Very we’ll written, as usual. I hope it prompts conversation amongst others be they adoptees or their parents. Not a bad looking Van Dyke, by the way. I always thought it was a goatee, but that beard is just the chin with no mustache. So there is your manscaping tip for the day. Another great blog entry, John. Keep on healing. Take heart, sometimes it takes adoptees decades to work through everything, and get the courage to start looking for information about your first parents. Adoptee loyalty toward the AP’s can be strong, and the subtle or not so subtle insinuation that you are doing something wrong if you want information about your first family. The best thing you can do as an AP is to start the ground work for your daughter now, and to talk about it. All too often our first parents are the Pink Elephant in the room, where the AP’s don’t mention it…dreading when it does come up… and the adoptee picks up on this. Its like the worst thing you can do. My AP’s never mentioned anything about my first family, and when It did come up I was met with “they were 22 and 23 and that’s all I know” and a slightly hostile tone… Of course they knew more than just their ages. It took me 23 years to work up the courage at 42 to finally go through with contacting the adoption agency and get non-id information. In my mind, my first family abandoned me, they didn’t want me. I was the 2nd choice for a child with my AP’s… the consolation prize to infertility. Adoptees are forced to like a square peg to try to fit into a round hole of the AP’s family…. the mind thinks, I must make myself fit into this new group… become one of them…. and you’re not… and you never will be. In fact you fit in no where, you know no one related to you… and its a very lonely place that is very difficult to verbalize. Floating in society. It’s only when we do find our first families that we are able to root ourselves to society, we have a tribe.. we know what we are suppose to look like, act like…. etc. Thanks so much Tracy. Very well done! First, would like to say thank you for writing your book. I just found out about it last night, and will order a copy today to read it. To write it took bravery, and it will help others. I hope to share it with my adoptive parents. I am a 49-year-old adoptee, and and everything Tracy said is true. Love, compassion, and a very merciful, generous and creative approach to abandoned children is necessary if you want to raise them to have a chance at being healthy as adults. And, I say “have a chance at being healthy” because it is not up to the adoptive parents (and sometimes not even the adoptee) what the child/person does with their path. Environmental factors combine with genetics to create an outcome so compelling, it can be out of everyone’s control — unless you attack the problem from the right angle and the individual reaches an effective response. Adoptive parents either make life harder or easier for the adoptee. That is all. You screw ’em up, or you help ’em heal. Those are your choices. The damage has been done. One thing that would make the entire situation of abandoned children better for everyone across the board would be to get rid of the idea that contact with the biological family should be a negative thing in the least. If you want your child to be maximally healthy then whatever contact is available, at whatever point in time it occurs, should be embraced and allowed. Everyone has the right and the need to know who they are and where they came from. A human adult can’t feel themselves to be a full participant in the human race and society without that knowledge. The detached / hatched / untethered / floating feeling among (no knowledge, closed adoption) adoptees at times is universal. Adoptive parents also need to realize they can’t necessarily fix a problem another person caused, nor is that up to them to do. For example, if you go and beat up your longtime neighbor, who’s also your friend, to the point he’s disabled for 6 weeks, and then I show up, a stranger from across the country, and do everything in my power – financially, emotionally, physically – to get him better again, and care for him every day of his recovery, will that make him less upset with you? He might think I am great, but he’s still going to be mad at you. If I convey to him that it would hurt me deeply, or be disloyal to me, for him to have anything at all to do with you again, might he not get frustrated enough after awhile to say, “Look, at least I’ve got to talk to that SoB and find out why he did that!”? When a person is abandoned by their family (and this is what they are – their genetic family – which is the original meaning of the word parent), and this happens during infancy and early childhood, the entire personality, physiology, and emotional, mental and psychological structure are modified. If this is not recognized and handled appropriately, the entire adoptive family structure, and the adoptee, can be doomed. Hi Katie – Thanks so very much for your comments. I agree with everything you said, and connecting with many adopted adults really helped open my eyes even further to the trauma adoptees face, one that is still misunderstood. I am a birthmother of a son born in 1971. When Katie refers to the original family as abandoning the child, i think this is a cruel way to explain what happened to birthmothers. Our boyfriend or family abandoned us but i never abandoned my son. I have always thought of him and contacted him when he was 13 in a short letter, explaining who i was and to tell him that i had always thought of him. I wanted to write this letter in case he had doubts and felt that he had been abandoned. Abandoned is not the right word. My social worker wanted a friend of hers to adopt him and this unprofessional attitude hurt me very much. Adoption of an infant to me involves an adoptive parent taking advantage of the fact that there is a birthmother that is struggling out there to survive and to help her child survive. All the old fashioned ideas of adoption really belong to the past when women that were unmarried and got pregnant had to hide. I never hid what happened to me. Adoption of my son was one of the lowest points in my life. And when i have talked to people about it, many people say things like, “he must have gotten a great home”, or “it was for the best”. I think in an adoptive parents’ mind, the birthmother will always be a confused teenager that needed rescue. The pain of the loss gets worse over time, though one gets used to the pain in some way. Adoption was the worst decision for me. I wish i had been able to raise my son, to have a normal life and to be his mother. I will always be his mother though our relationship will perhaps always be complicated by adoption. I think that adoption is more of filling a need for adoptive parents to have a child than anything else. A lot should be changed with adoptions. It leaves a birthmother, shattered with little support. Counseling is mentioned as something that a birth mother gets, i got no counseling at all. Pat S.
I couldn’t agree with you more. 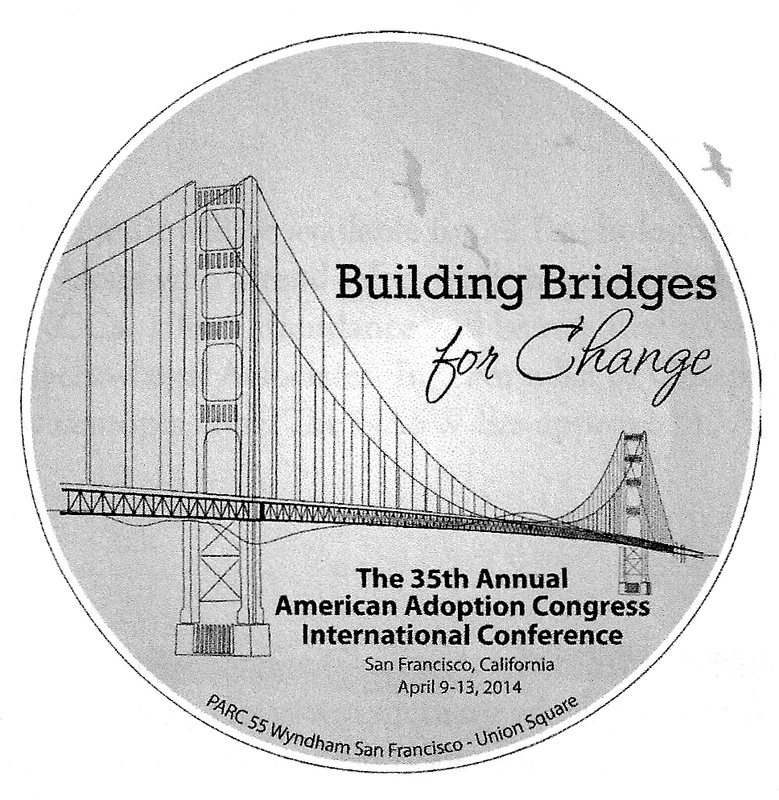 After going to the AAC convention I strongly believed that every adoptive or prospective adoptive parent should have an opportunity to meet and share experiences with adopted adults and birth mothers to truly understand the complexity of adoption for all concerned. Al too often there is a false narrative that everything’s groovy once they pack that baby up and go home. I’m a birthmother myself so I don’t at all mean to belittle what you are saying as it is all spot on for the birthmother experience, but I have to say that for the adoptee.. it still often IS abandonment. Not in a literal sense; like even if the adoptee later does find all the reasons why the adoption happened- the lack of choice, often the actual literally forced surrender, the impossibility of parenting, no support form family, fathers, or society, – they can mentally understand that we did NOT abandon them of our own free will and desperately desired to know our children. But it’s the FEELING of being abandoned that is at the crux of many issues. Not the reality if they were or not.. but what it felt like to them knowing that they had been given up. So it’s not meant to be a cruelty fostered upon us, but of a reality of their feelings that are there often since childhood. And really, it’s not something that we can now fix nor make up for.. it is just there. So it’s hard as heck to not take it personally, but obviously we couldn’t prevent it then and we can’t take it away now. I do think that we do need to acknowledge and accept it as a very real reality for some adoptees and not to make them feel that they must further watch what they say and edit their experiences because what words fit their lives might hurt the mothers. And don’t feel bad that you missed out on the glorified “birthmother counselling”.. usually its an agency hack who only gives additional doses of “you did the right thing”. Most moms now I know who are looking for therapeutic help turn to counselors who specialize in grief and loss because all too many have NO training at all in adoption issues and repeat the ” get over it” “it was in the past” mantra. But I am with you.. the adoption of my son was the biggest mistake of my life. John.. super glad you enjoyed the AAC! It was a great conference.. would love to see more adoptive parents come and get out of it what you did. Thanks for writing about it! The first AAC Conference I went to, gave me the same insight John. Been to many of them now and I agree, that AP’s need to embrace their position in the child/adult child’s life and then be mindful of the heart and soul of that child/adult child.